As hinted at recently, Nintendo announced via today’s streaming Nintendo Direct video that their Virtual Console service, which already provides digital purchases of older titles on the Wii and 3DS, will be coming to the Wii U sometime this spring. 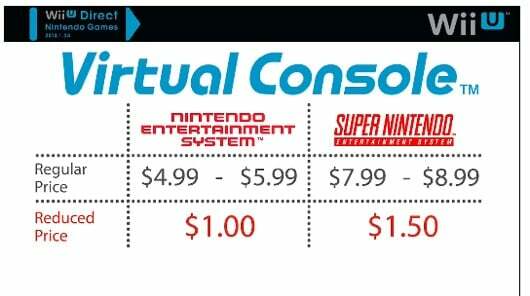 The Wii U Virtual Console will initially launch with a limited amount of NES and Super Nintendo games. Nintendo of Japan’s president, Satoru Iwata, noted the reason for not having everything available from the start is due to the games being redone to support saving and gameplay on the Wii U GamePad. NES games will range from $4.99 to $5.99 in price, while Super Nintendo games will range from $7.99 to $8.99. For those who already purchased the games on the Wii and are wondering if another purchase will be required to get the same titles on the Wii U, the bad news is that players will still have to pay. The good news is that, so long as you’ve transferred your purchases over to the Wii U via the free System Transfer application, you’ll get a major discount when you buy the games a second time. Discounted NES games will only cost $1, with Super Nintendo games costing $1.50. Iwata also confirmed plans to add Game Boy Advance titles to the Wii U Virtual Console lineup at some point. To get players geared up for the service, Nintendo will also start offering individual titles on a monthly basis starting today. The planned lineup includes Balloon Fight, available right now on the Wii U for 30 cents, followed by F-Zero in February, Punch-Out! in March, Kirby’s Adventure in April, Super Metroid in May, Yoshi in June, and Donkey Kong in July. While the news that the initial Virtual Console lineup will be limited is a bit disappointing, the idea of playing classic Nintendo titles on the GamePad is definitely enticing. With any luck, this version of the service will eventually include as many quality titles as the Wii version offered – maybe even more. We will keep you updated on more news regarding the Wii U and the Virtual Console as it drops. Until then, feel free to leave your thoughts on this announcement in the comments.